The Steer Premium Cart offers a taste of the best by Bull: sleek design, long-term efficacy and the promise of cooking adventure. The grill cart is made almost entirely of stainless steel that is shaped seamlessly for a sleek, contemporary styling. And, the material promises longevity, too. Stainless steel is the best of the best in the world of outdoor grilling, as it combats the rust epidemic that used to send grills to the junkyard every time you turned around. Not all stainless steel is created equal, and Bull promises to use the best, and the thickest, on important pieces like the hood, the grates, the burners and more. Last, advanced grilling capabilities will keep you adventurous and exploratory in the world of cooking. 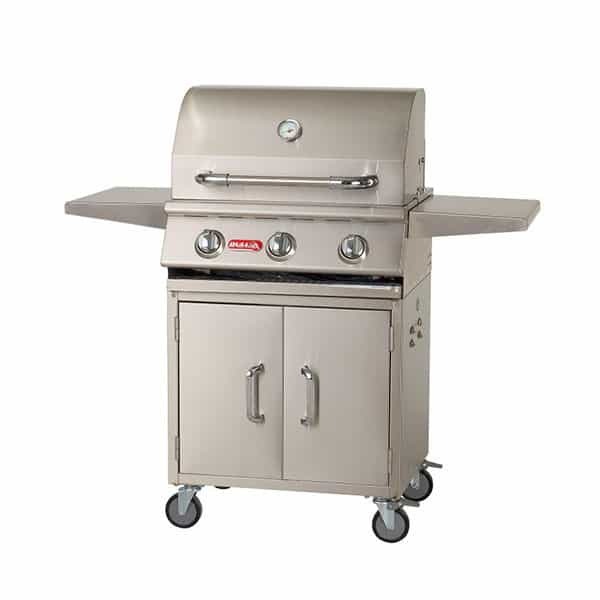 Mix and match the use of three separately operated main burners, an integrated smoker box and a warming rack. Bull beckons you with the promise of a fashion forward style, guaranteed longevity and new recipes to boot! Cutout Dimensions 25" x 48" x 48"